Quite simply, the best of what Edinburgh has to offer is right on your door step as the apartment is located in the heart of the City (see our map “photo”). Scotland’s premier tourist hub, namely the World famous Royal Mile / Holyrood Palace (the Queen’s residence) / Scottish Parliament / Arthur’s Seat (set in a 650 acre park) area, is within a 5min walk, while a 5 min walk in the other direction takes you to London Road (a major bus nexus providing access to Princes Street in 5mins and routes to the Old/New Town, the Royal Yacht in c.15mins and Edinburgh Zoo in c.30mins etc). And, despite its central location, the apartment benefits from much sought after FREE WiFi & FREE on street parking! The large dining table is situated in the Kitchen, next to the window. There is seating for 5 & a chair mounted high chair is available. Some board Games are available. The apartment is located very centrally to the heart of Edinburgh and is walkable to the castle and royal mile. Free parking and great amenities which are warm and comfortable with everything you would expect and more. Large enough for 6 adults if needed without being cramped and spacious seating. Loved our flat in Edinburgh! Our family was visiting Edinburgh. The flat was perfect in every way, comfortable, spacious, and charmingly decorated. Our hostess, Eleanor, met us right on time making our check-in very easy. The flat was in a wonderful location at one end of the Royal Mile, near Arthur's Seat. We could walk everywhere, the castle, museums, shopping, pubs and restaurants. We also cooked several meals in the well stocked kitchen, a near-by market had everything we needed. Eleanor had many extra homey touches that made our stay even more enjoyable, maps, site-seeing books, suggestions for restaurants, games, books and fresh items in the kitchen. We never had any problems or questions but I'm sure if we had Eleanor would have responded quickly and professionally. Scotland is a beautiful country and Edinburgh is a magical city and we can't wait to get back, we would definitely stay here again. Thank you, Eleanor! Eleanor was a gracious host. Gave us plenty of information regarding pubs etc. We could walk to all the attractions from the apt. 2 couples recently stayed in this apartment. It is located very close to Holyrood Palace, the Scottish Parliament and Princes Street. It is also close to Arthur’s Seat. The apartment itself was very clean and well stocked, including bread, milk and fruit (We have stayed in many apartments but rarely had these items provided, what a treat!). There is lots of free parking which was much appreciated as we had a large vehicle. One bedroom is en-suite, although the shower is small, and the other bedroom has twin beds. All the beds were very comfortable. The eat in kitchen had all the utensils that you would need and the living room was fine. The apartment is on the first (2nd floor to North Americans) so it was easily accessible. It is in a block of apartments which was a bit off putting but In fact it was very quiet. Eleanor sent us a lot of local information before our arrival, which was very useful. The only downside was the wifi which kept dropping the signal. Also a few rugs might make it a little cosier. I would have no hesitation in staying here again, or in recommending to others. Very comfortable well located flat. All of the rooms in this cozy flat are a good size, light and bright. Furniture could use a slight upgrade and a little more juice in the wi fi to better power kindles. Phones charged just fine. We would stay here again. Good location. 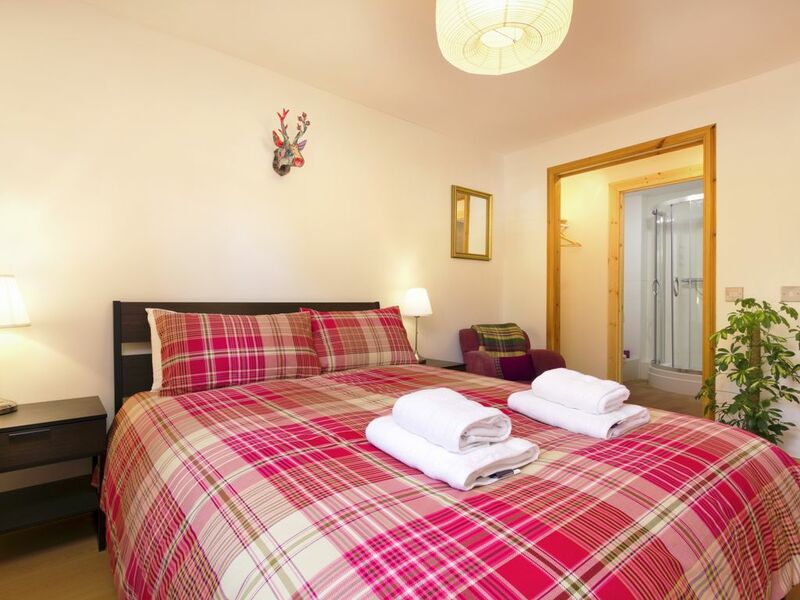 This property provides everything one needs for a stay in wonderful Edinburgh. It is clean, convenient, quiet and has very good bathrooms and showers. It worked very well for 2 couples. It does not have a lot of frills and decorations are modest, but if you are looking for a very functional place to stay, this will meet your needs. A) Bus/Airport: The Airlink 100 service (£4.50) runs from the airport to the City Centre (Waverley Bridge), from where it takes c. 20mins to walk to the apt., although we recommend using a phone GPS tracker. D) Car: Nearby access to the city bypass & motorway networks is very useful. It can sometimes be difficult to find free parking in Edinburgh City Centre but Tytler Gardens and the surrounding streets are about as close as you can get to the City Centre, the Royal Mile and the Old Town and be able to PARK FOR FREE at all times. 1) Tytler Gardens: The apartment is very centrally located with all of Edinburgh's tourist attractions within easy reach. Ideally situated for the Royal Mile (5 min walk), Palace of Holyrood House (5 min walk), Scottish Parliament and Dynamic Earth (5 min walk) as well as having the beautiful Holyrood Park right on the doorstep. Nearby, there are also numerous festival and 'Fringe' venues (it’s a 10 min walk through the park to the famous “Pleasance”), the Grassmarket / Cowgate (15-20 min walk) and Edinburgh Castle (15-20 min walk). 5) Walking in The Green City: Edinburgh is a fantastic city to visit and is small enough to walk around. Holyrood Park, Princes Street gardens and the meadows (tennis & pitch n putt golf!) are popular places for a stroll, offering a change to the ever present guided historical / ghost tours! For the more energetic, Arthur's Seat (1min away), an extinct volcano, is crisscrossed with walking trails and is popular with runners / cyclists as well as tourists for some of the best views of the city from Salisbury Crags. In addition, the Botanical Gardens and Edinburgh Zoo (No. 26 bus from London Road, c30mins), home to the UK's only Giant Pandas, are both worth a visit and are accessible by nearby bus routes.